Important 2018: This site is no longer US friendly. With an eye on environmental and social responsibility, Bingo Hall is a legal Internet bingo site for real money play. Birthday bonuses and a VIP program reward frequent users, and special chat games allow you to communicate with other Internet bingo lovers around the world. A wide variety of bingo games is offered at all financial levels, with the parlay games software package providing access to progressive bingo games with jackpots frequently in the tens of thousands of dollars. 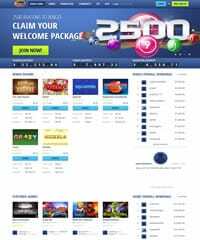 Sign-up is free and easy with no download required, and special daily promotions offer new players $25 no deposit bonus and an incredible 500% bonus on your first 5 real money deposits to the site. Bingo Hall was first established in 2002 and have been one of the premier online bingo destinations for USA and international players for years. You simply can't last that long in the online gambling industry unless you are trustworthy and take good care of your players. What makes BingoHall appealing to most is the huge welcome bonuses they offer to new players. With a 500% bonus on each of your first 5 deposits, and daily ongoing promotions, it's no wonder they are a favorite or thousands of players all over the world. They are absolutely legit. You can't last in this industry for over a decade unless you are reputable and pay out winners in a timely manner. Parlay Games, Inc. has been providing what is recognized as arguably the best all-around Internet bingo software since the late 1990s. The extremely flexible bingo software allows for site-by-site customization, social networking interaction, mobile PC and smartphone support and a wealth of progressive jackpot offerings. This Internet bingo software solution is a favorite of players, because it is extremely reliable and dependable. Aside from supporting bingo, slots and casino games are also found on parlay sites. Thawte SSL certification means secure data transmissions via safe software across the Internet. Public-private key encryption techniques provide globally identified digital certificates that mark a secure and reliable transfer of data. Licensing and certification - Is Bingohall Legal In the US? Licensing has been obtained in Curacao and regulated by the Curacao Gaming Commissioner License No. CEG-IP/2014-1511. This gives Bingo Hall the ability to legally offer online bingo, slots and other gambling options, as the Curacao government certifies and regulates online gambling providers. This also develops legal access for US players, as Curacao falls outside the scope of the strict United States banking laws which have limited access to reputable Internet bingo websites like Bingo Hall. Aside from getting you started with $25 in free play money, new players also receive a 500% bonus on each of their first 5 deposits for a total of 2500%. Daily specials are the big draw, as there are literally dozens of promos and bonus money packages offered every day of the week. There are also monthly specials totaling more than $5,000 in cash and bonus money. A Birthday Bonus rewards you on your special day, and a special Cash Back Bonus reimburses lost money in specific cases. Daily bonuses and promos include Candlelight Delight (rewarding play between 2 AM and 7 AM EST in the After-Hours Lounge Room), special chat room bonuses, and a Brave Monday deposit bonus that matches anywhere from 250% to 400% of deposits made on that day. The bonus packages are so extensive, we can only highlight them here. You are recommended to hit the site, click on the "Daily Promo" tab near the top of the page to appreciate how many bonuses and promotions are available. A click-through link has been provided below. The games and jackpots that this Bingo Hall Review uncovered are as diverse as the many bonuses the company offers. More than four dozen 1 line, 5 line and 9 line slots games are available, as are many popular variations of video poker. Keno and pull tab games are also offered, as are special weekly bingo tournaments. There are also seasonal tournaments centered around celebrations and holidays like Easter, the Fourth of July, Christmas and New Year's. Play begins as cheaply as $0.10 for a single bingo card, and Bingo Hall also offers a free practice bingo room with cash prizes. You can pre-order cards for any bingo game, so you never miss a chance at a powerful progressive payday like the $21,559.10 jackpot which we recently spotted in the Dollar Jackpot Room while conducting this review. The site software automatically marks your cards and registers wins, so if you have to step away from your computer or smartphone, you are covered. 75 ball and 90 ball bingo games are supported. Bingohall uses the latest and secure technology offering SSL encryption for everything which ensures all players sensitive information remains private and out of reach from prying eyes. Verified by Visa and MasterCard Secure Code deposit options are available for international and US players. You can also use your American Express card to make a deposit. Electronic check and money transfer options are also supported, with non-US players benefiting from InstaDebit, Neteller, Skrill and EcoCard options. Withdrawals are made via bank wire or courier check. Yes, all bingo and casino games are mobile friendly allowing players on the go to enjoy playing while on the move. Their mobile friendly app is compatible with IOS Apple iPhones and iPads, Android and Windows devices. As a socially responsible entity, Bingo Hall is a certified member of Gamblers Anonymous International. Player identification and verification guarantee that you are at least 18 years of age to play, and as a member of ChildFund, Bingo Hall makes regular contributions to child protection and health care advocacy programs. Continuing in the website's social responsibility efforts, Bingo Hall supports sustainable charitable organizations and philanthropic causes, as well as addressing environmental concerns. Bingo Hall, aside from making an admirable statement as a globally conscious Internet bingo provider, also delivers the goods on the gaming side. From slots to keno, video poker to bingo, there are plenty of gaming options. US players are supported due to legal licensing in Curacao, chat games keep you socially involved just as if you are at a physical bingo parlor, and you can sign up for the Bingo Hall newsletter that keeps you informed about special tournaments, bonuses and promotions. Also, multiple banking options are provided, and with a reputation of providing Internet bingo excellence for years, Bingo Hall is a fun and dependable, secure and enjoyable online bingo option. We also have additional online bingo reviews of other reputable brands that you may be interested in.